3200 George Washington Memorial Pkwy. 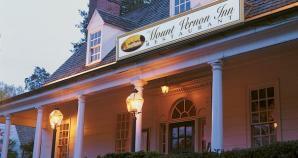 The Mount Vernon Inn Complex has two dining options. The Food Court Pavilion offers quick and delicious selections for breakfast, lunch, and snacks. Visitors on the go can purchase made to order salads, fresh wraps, grilled Panini's, burgers and sandwiches, personal pan pizzas from Pizza Hut, delectable freshly baked cookies, and both soft-serve and hand-scooped ice cream. The Mount Vernon Inn restaurant serves lunch daily, brunch on Saturday and Sunday, and elegant candlelit dinners Tuesday through Saturday. Savor regional and colonial cuisine in one of six intimate dining rooms— – two with fireplaces. Reservations for dinner are recommended. The Catering Office hosts tour groups, corporate events, and social functions, such as holiday parties and weddings. Brunch served only on weekends. Additional Metro Info: Take Metrorail's Yellow Line to Huntington Station. Exit at the lower level of the station (Huntington Avenue) to catch a Fairfax Connector bus to Mount Vernon. Board the Fairfax Connector Bus #101, the Fort Hunt Line, for a 20-minute trip to Mount Vernon's entrance gate.